Magic in the Baghdad Cafe: Serenity. The Movie. Shiny. For them's that want a rip-roaring tale of colorful characters and blazing action, nothing will eclipse Josh Whedon's Serenity. Resurrected on the Silver Screen, the richly convincing worlds first revealed in the doomed TV show Firefly, will bring Whedon's tour de force to a wider audience. I am so happy. Don't know about it? I will post a review when I've seen it. Which I hope will be this Monday the 26th. Can't hardly wait. Stay tuned fellow Browncoats. 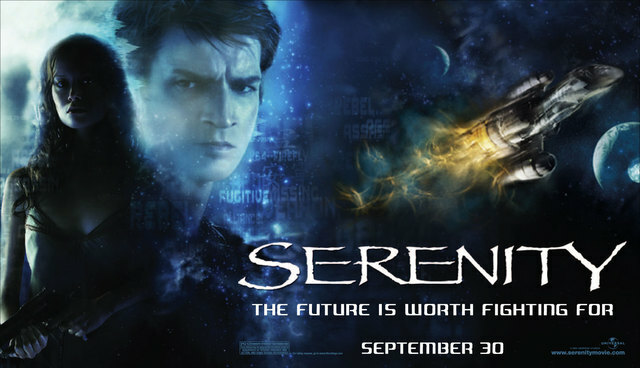 Although the movie's very good, I think it needs to be stated that it's not as good as the TV series, Firefly. Not that you could expect it to be. And the Firefly DVDs have some good extras and some very entertaining commentaries by the actors (and very boring commentaries by Joss Whedon). Another space movie, I hope it haslots of special effects that are not to boring to watch. Thanks for sharing! I watched it and it was awesome! I must say, I am not a fan of this genre, but a friend of mine 'pressured' me to watch with him - and I was really amazed !